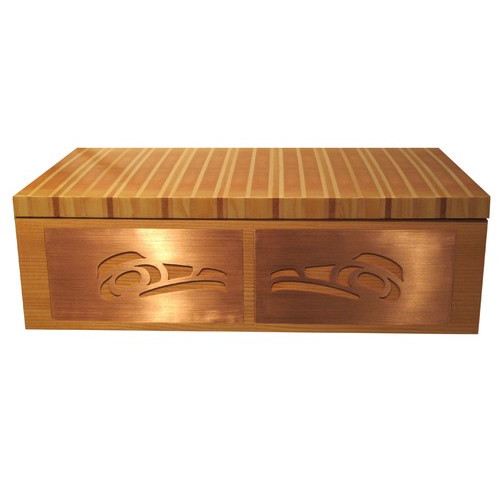 The front features raven in copper. The top surface is made of a colourful solid wood laminate, the rest of the unit is made of solid fir and finished with hand-rubbed natural oils and resins. The unit is ~18” w x 11” d x 6” h.
This small wall unit can be a beautiful addition to an entrance way, a home office, or wherever a small storage unit is needed. The front features raven in copper. The top surface is made of a colourful solid wood laminate, the rest of the unit is made of solid fir and finished with hand-rubbed natural oils and resins. The front opens into one compartment. Wall attachments are concealed in the back.